Scroll down for a free printable Map of California Cities. Shown above is the California town of Seal Beach. Seal Beach, a California city located in Orange County, has a population of about 25,000 people. The city spans just over thirteen square miles. The area's balmy landscape has served as an ideal location for several film and TV productions. Shown below is a scene from Main Street. 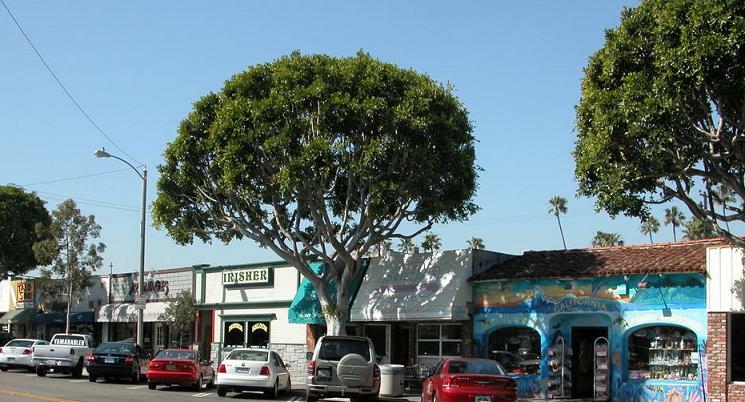 Businesses at Seal Beach include quite a few antique stores and dozens of fine restaurants. Other Seal Beach attractions are Electric Avenue's Red Car Museum and a long wooden pier at the beach, with a popular restaurant called Ruby's Diner situated at the far end. Visit any link shown on this page for a list of cities in California, links to the state's most popular destinations, population estimates, real estate info, geographical data, and a collection of handy printable maps, along with other free printable and sharable items. Totaling nearly three million acres, San Bernardino County is the largest county in the whole United States. San Francisco Bay is the largest landlocked harbor in the entire world. More sourdough bread is produced in Oakland than in any other city in the world. In the midst of summer, Point Reyes has the lowest temperature in the Continental United States. Monterey is ranked the world's number one golf destination by Golf Digest. The redwood is the official state tree of California. Many of the giant redwoods in Sequoia National Park are more than 2,000 years old. The city of Los Angeles is home to a Museum of Neon Art and a Sci-fi Monster Museum. The town of Castroville is known as the Artichoke Capital of the World. The town of Gilroy is known as the Garlic Capital of the World. Battery Point Lighthouse in Crescent City is California's oldest lighthouse. Built in 1856, it is still in operation.